The Council of the Borough of Middletown, Dauphin County, Pennsylvania, is seeking applicants for the Middletown Borough Historic Restoration Commission, Planning Commission, Police Pension Board and an alternate for the Zoning Hearing Board. 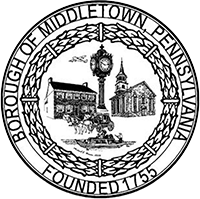 An applicant must be a resident of the Borough of Middletown to be eligible for these positions and appointments to the Commission would be made by Council in accordance with applicable law. Interested parties must send a letter of application indicating area of interest to jobs@middletownborough.com. All applications must be received not later than Friday, March 23, 2018.